In what has proven to be a common annual phenomenon for the hay market, the average market price of hay declined in June, based on USDA’s most recent Agricultural Prices report released last week. The All Hay price dropped $7 per ton to $160 but still remains $15 higher than June 2017. Other Hay (hay other than alfalfa) dropped $1 per ton to $121, which is $4 per ton lower than June 2017. The average June Alfalfa Hay price dropped to $181 per ton, $8 per ton lower than the previous month but $27 higher than one year ago. 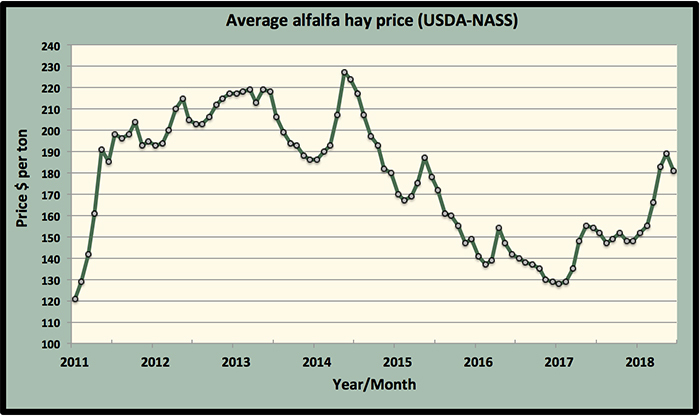 The Alfalfa Hay price is still $32 per ton above last December. As a general rule, annual alfalfa prices peak during April or May. The largest Alfalfa Hay price gainers in June were Oregon (up $20 per ton) and Washington (up $15). 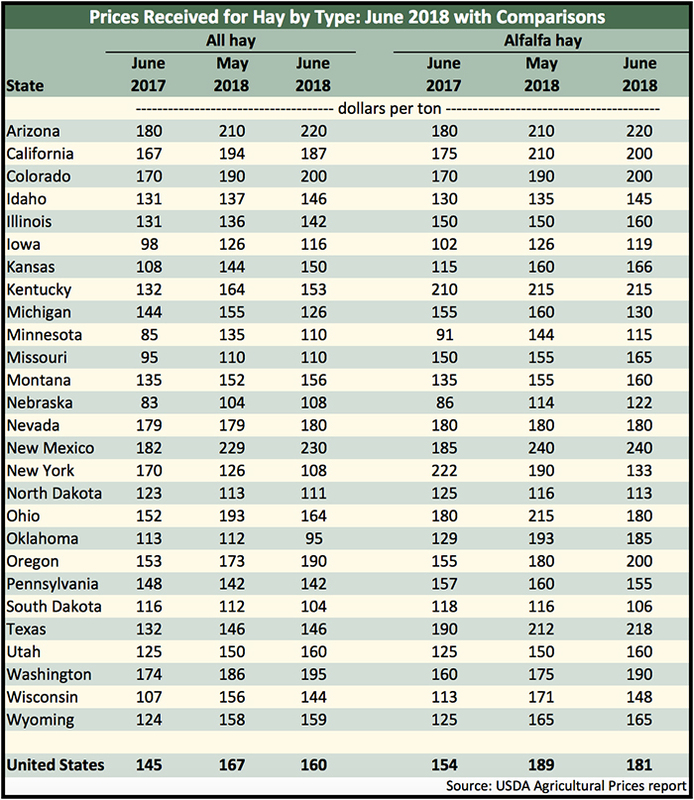 Arizona, Colorado, Idaho, Illinois, Missouri, and Utah all had $10 per ton gains. Price decliners included New York (down $57 per ton), Ohio (down $35). Michigan (down $30), Minnesota (down $29), and Wisconsin (down $23). The highest average Alfalfa Hay prices were reported from New Mexico ($240 per ton), Arizona ($220), Texas ($218), and Kentucky ($215). California, Colorado, and Oregon checked in at $200 per ton. The lowest prices were found in South Dakota ($106 per ton), North Dakota ($113), and Minnesota ($115).